How could I have missed this I wondered? I picked up my find, gazed upon it, then tossed it into the plastic shopping bag at my hip filled with shells, sea glass, and assorted careless litter I picked up while on our walk. Back at the house we compared finds with soft ooohhs, ahhs, and several exertions of wow, how neat. Like a sport, we try to outdo each other with our stash. My sister shared a humorous story of collecting with her daughter: “Wow! Look at the pretty piece of sea glass mommy just found,” and held her hand out to show my niece. Her excitement deflated greeted by the two-year-old’s own out stretched hand that held a much larger and more spectacular piece of sea glass. “My shell shell,” she remarked in an innocent voice. I pulled from my bag my share of the loot. “Check this piece out,” I said. 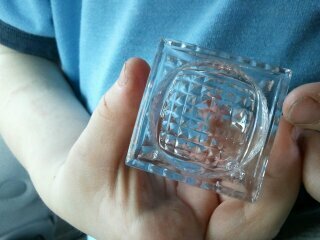 “What do you think it could be?” We examined the sandy square weighty glass piece with a circular depression in its center that revealed a diamond pattern stamped bottom. The piece although marred by the surf, retained its original beauty. We speculated over what it was. The slightly heavy weight gave thought to a small paperweight. My husband suggested an inkwell although under consideration we rejected this notion, as the depression seemed too shallow. Was it part of a candlestick now broken and without its mate for untold years? Had it broken off an ornate liquor bottle, formerly a stopper perhaps? We were stumped noting its edges remained clean and the circular rim appeared smoothed intentionally, not the result of a break. Not one of the four adults present was able to identify the mystery piece or how it may have ended up on the shore of a Buzzards Bay beach. The fall air changed and the (albeit mild) winter season moved in. Typically, pottery chips, glass shards, and washed up flotsam I collect are added to clear glass vases about our house. This piece however was special; I had taken a particular liking to it and it adorned my bureau. I wanted to know what it was or what it had been, its story I wanted to understand better. I loved the optical illusion it gave when looking into the center depression to diamond cut detailing. When the sun came around and brightened the room, it took in the rays reflecting back prisms to the surrounding room. I could imagine it offering this same greeting to the monochromatic sand where it had once been stranded. I felt compelled to share it and its story. In early February I mailed the shard to my uncle. It was a new journey I imagined, carefully wrapped and enclosed by a padded mailer, making its way safely across the state. I included a letter that began: “In 2012 I am continuing my goal of improving myself and bringing my artwork to a new level.” My note talked about enjoying everyday moments and embracing the sorted uncertainties our lives can pose. “I wanted you to have this small glass shard,” I continued. “I am not sure what it actually is; I do know it doesn’t belong amongst the shells and sand of a Cape Cod beach. I wonder how it got there, what was its journey and marvel that even though it is out of place, its beauty shines as it captures the sun’s rays and casts back a beautiful unique rainbow as a gift to the shore. With minimal chips, it survived. I am not sure what you may do with this little gem. Maybe place it on a window where it can continue to bring prisms to all around as it reminds us to make the most of all uncertain journeys of life.” I found enjoyment in sharing my found treasure with him. A few days later he called to let me know how much he liked the glass piece and my expression of self-journey. “Mom, it’s like your piece,” remarked my son. He was correct; there on the cluttered table was a piece that looked exactly like the one we had found on the Buzzards Bay beach. For $5 including tax I took the vintage salt cellar home to replace the one I sent my uncle. Although proportionately the same glass square with a circular depression and diamond stamped bottom, the two pieces indeed were different. My original salt cellar was weighty and smoothed by surf, but still whole with minimal chips. It had brought dimension to the sandy beach amongst the organic materials of shells and sea weed, and an occasional tennis ball from a game of fetch gone astray. I now knew it belonged on a handsome tabletop, filled with salt to accompany a carefully planned dinner. In that setting I imagined it reflecting candle light from an ornate candelabra, not the sun’s rays I had previously imagined and enjoyed upon my bureau. Its journey brought it in contact with untold sea creatures and chemical debris tossed about on the cool current of Buzzards Bay, making its way almost to the famed Cape Cod Canal. As the world kept changing the salt cellar was out of fashion, replaced first by the salt shaker and then not to be seen at all on the table as we learned of the excessive sodium found in today’s prepared food choices. My salt cellar had somehow been discarded to a watery new life no longer filled with salt but surrounded by it. What about the $5 salt cellar and its journey? After its fall from tabletop fashion was it tucked safely away amongst fine china and delicate ornate wares? I discounted this idea noting it had considerably more chips than that of its seafaring twin. Also, it was less weighty than my original leaving me to question if it was merely a replica with an even less interesting former life? It became clear to me I enjoyed the seafaring salt cellar so much because I would choose to be the first over the second. As I had expressed in the letter to my uncle, I would rather endure the unpredictable journeys of life than be tucked safely away. I appreciate at any moment one can be chipped and broken or reflect the sun’s rays.